IPA, IPA, IPA. But among the ones mentioned it was Complot that undoubtedly caused the greatest agitation. The reasons can be found in the strategy that, until then, Damm had maintained. In fact, only four weeks before the launch, master brewer Karen Peiró assured during the sectorial symposium cycle at the Barcelona Beer Festival that they were indeed 'the most conservative' of the major peninsular brands, focusing on 'parallel routes -linking beer with gastronomy- instead of fashions'. It is clear that she knows how to keep a secret. In any case, the former beers have a common denominator: the fact of placing the aroma of hops as a commercial bait. Another factor in which they converge is their reception, generating endless comments in social networks, going from the typical haterism to the prudence of a 'let's try them first'. Indeed, there have been many discussions, more or less organised, more or less interesting, about why the big brands 'are riding the craft wave' or even -how come we are still at this point in 2018?- whether or not these new launches can be considered as craft beer. One of the biggest concerns, it seems, is the damage that these can do to the craft scene, with some commentators adding that the abovementioned are substandard beers. All this brings me to share some observations of my own about it. If we start from the beginning, we must go back to February 2016. After some time flirting with the craft scene in terms of marketing, Moritz launched its Red IPA, brewed at the facilities of Ronda Sant Antoni, where it was served on draft for a very limited time. The test turned out to be successful, so they launched a bottled limited edition in May 2017 -which is still being sold today-, produced in the facilities of La Zaragozana -Ámbar-. 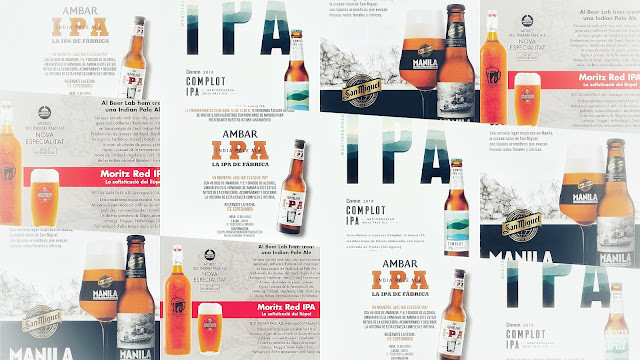 It was a disruptive movement by the Barcelona brand, which however lost the opportunity to produce an ambitious and groundbreaking product, staying halfway with a beer that, even fresh, presents a faded hop aroma, in addition to a remarkable adjunct character that really doesn't match the collective imagination of what an IPA actually is. Next in line were San Miguel, who released Manila without going out on a limb. A 100% San Miguel product, with such an aromatic ambiguity that I had to rescue the press release -given that it is omitted on the website- to confirm whether it was a high or bottom fermented beer. The 'careful selection of aromatic hops' translates into fruity and floral hints that, without being overpowering, do make themselves known. Despite a slight phenolic rubber aroma, somewhat annoying, it's a beer I would order in a bar with just the brand's portfolio on offer, being a good alternative to the usual. stuff. However, it is hard to think that its path will be long, mainly because cannibalism on other historical products of greater value, such as 1516 or Selecta, is its highest hope. This beer will not thrill anybody who is not already a San Miguel drinker. Circumstance of these turbulent times: a beer born to disappear in a few years, or to be notably mutated. 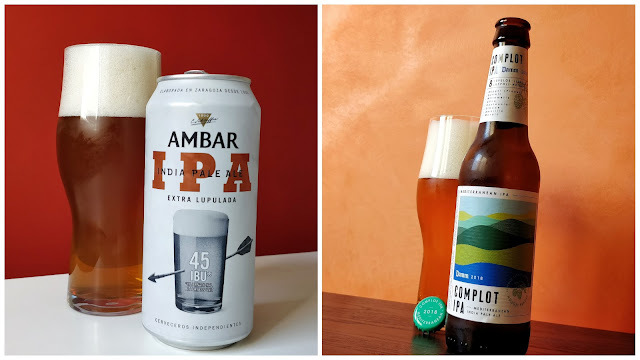 I think I am free of any suspicion of favouring Damm at this point, but if we talk about their Complot IPA it is fair to recognise that it is a good product. It is true that the marketing department has, yet again, been vaguely miguiding with some messages related to the use of their own Mediterranean hops -only one of the eight hops used is actually grown by them, and it is the bittering one-, but it is a a step forward to see them highlight the varieties used, even when on paper it may seem absurd to use so many different hops in a beer such as this. It ages ungracefully, like most IPAs, although the efficient planning and logistics apparatus of the company has ensured so far that I have only found fresh stock in most of the selling points I have spotted it. Its biggest handicap? The price, since there are better alternatives in supermarkets for 1.90€. But for the brand's loyal drinker it undoubtedly is a good option to consider. Damm has taken up the opportunity that others refused -or weren't able- to take advantage of. Now I only hope that, some day, someone will tell me the inner joke behind the name. I also look forward to seeing how the hop plantations in Prades evolve. If we go to Zaragoza, let's just say that Ámbar IPA was an absolute disappointment. Not only because it is a product in which the aroma of ethyl butyrate makes for an 80% of what your nose can pick, turning the beer into a carbonated ester juice, but also because the expectations were high after some pleasant experiences with their 'Ambiciosas' series -see disclosure of transparency, below-. PR and production managers often seem to work in different companies -if the former is not directly an outsourced service-, but I have serious trouble understanding how somebody could give thumbs up to sending samples of this beer to industry commentators. If the batch did not turn out right, it had to be ditched; if the beer is really like that... I would suggest an adjustment. With this context, you will understand that the chosen phrase for its launching feels completely wrong -translated from Spanish: 'You may like it, or maybe not. That's the thing about IPAs'-. In his book Winning Chess Strategies, International Grand Master Yasser Seirawan, as opposed to tactical schemes, wrote about strategy in chess in the following terms: '[...] you no longer spend entire games reacting to your opponent; instead, you are proactive. You think through a position, set a goal, and methodically find ways to reach it'. 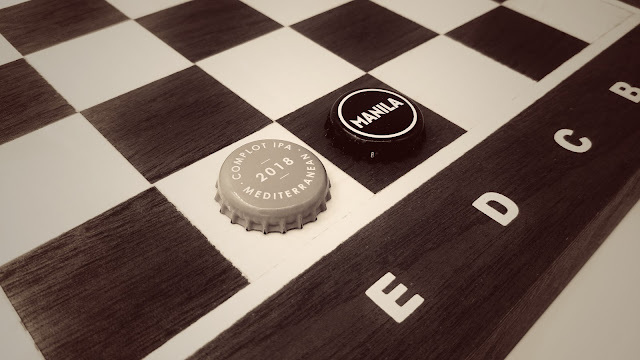 In this line, I understand the launching of the previous beers by the big brands as a tactical reaction, in an attempt to maintain a good reputation with their customer base and an image of modernity before the whole market, while watching their backs against potential infidelities. However, before the change of scenario that craft brewing has involved, I struggle to see if they have set a clear objective, and if they are methodically looking for ways to achieve it. Rather, it seems like a forced move: as in chess, no player can skip his turn. Although perhaps we could talk about a passive, or defensive, strategy by Damm. Despite focusing on fashionable hops and IPAs, it is true that Complot has a good potential in the on-trade, specially in restaurants. I share the vision of the brand that our local market, in 2006, was not prepared for Inèdit -brief note to point out that the one they sell today is a cheap imitation of what this beer was like at the beginning-. Now, with a good product that pairs well with food that does not match wine too well, which the market has been asking for increasingly for years and that serves, in turn, as a refreshing aperitif, it seems that they have a better chance this time. I have no doubt that the IPA will do much better than the 'Roja Fresca'. However, as with Inèdit at the time, I am still unsure to which extent the big brands are scoring an own goal by releasing this type of products. If you awaken the consumer's curiosity, and he discovers that there is a world beyond chilled lager, there is no turning back. 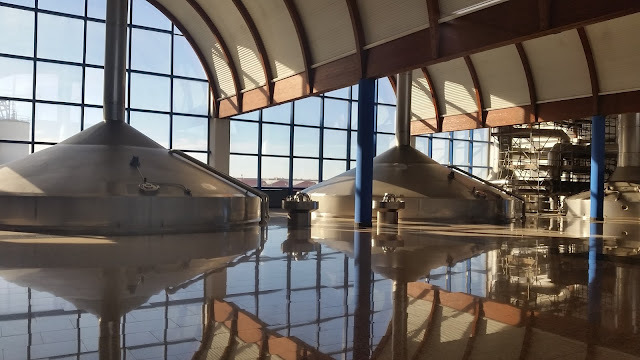 Mahou's brewery premises, in Alovera. On the contrary, the other major brand of the main Spanish brewing group, Mahou, seems to have a clear strategy. 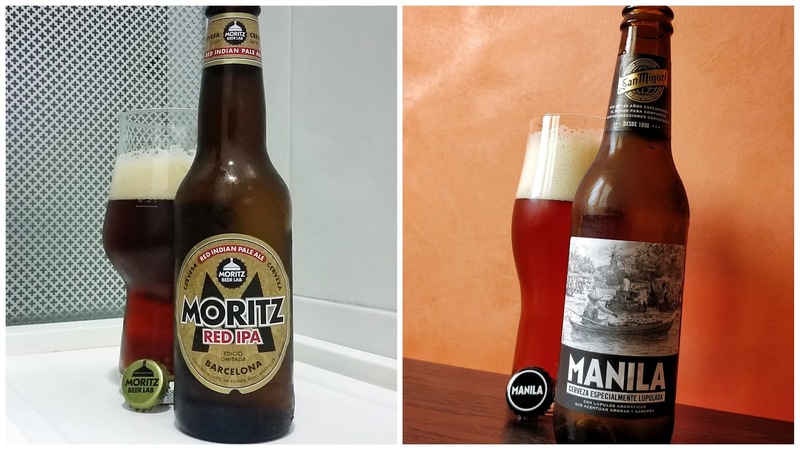 Unfolding the usual game, their action does not generate different or confusing messages for their drinkers: Maestra emphasises hops, but plays on the terrain they know and dominate, while Barricas are for now a mere divertimento based on their base product. But in turn it has more than one foot in the door of craft through other ventures -e.g. 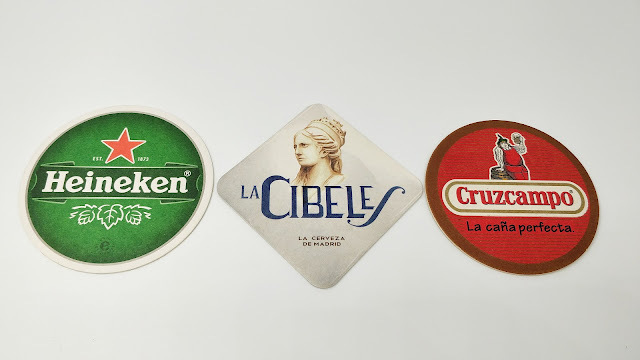 Founders, Avery, Pilot Plant, Brew Hub, Beer Sommelier, Madrid Beer Week, The Sainete-, grouped under its subsidiary Cervecera Independiente, whose branches are increasingly solid and reach further thanks, undoubtedly, to the good work they are doing both internally, as an innovation unit, as externally before the market. They do it so well that even the most critical sectors soften their involvement with them, who are part of the dominant beer group in the market, while selectively ignoring their omnipresence in the beer scene of Madrid. 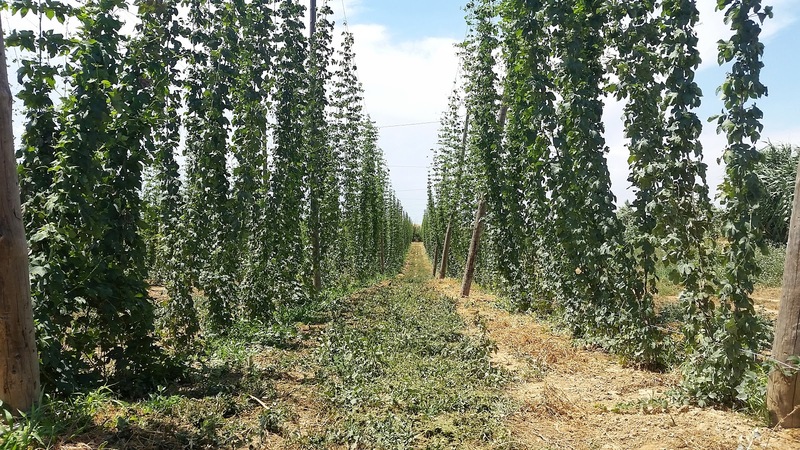 Lo Vilot's hop field, in Almacelles. I still have to meet a single consumer who, after deciding to try craft beer, has definitively given up drinking the rest of the existing beers because of a bad experience. There might be some, but this apocalyptic proclamation is as long-standing as our alternative brewing scene, and if we consider the growth it has experienced in a decade we can actually stand that we didn't screw it that bad. Analogously, it is unnecessary to invest energy in suffering because of the potential damage that the big brands' new releases can do. Also, in the opposite direction, I see no reason to think that the four analysed beers can win anybody's heart: in the best of cases, they will be able to satisfy the brands' faithful drinkers. Except in the case of Damm, it has been proved that targeting a sufficiently large public, even if it is not mainstream, implies certain renouncements. And in any case I have several doubts about whether traditional breweries 'playing craft' is not just another source to arouse consumers' curiosity. And now that? Let's keep on working, and innovating. Let's keep on looking for an own and distinctive character for our local beer, beyond empty marketing proclamations. And let's keep on growing, both in quality and professionalism, being a relevant variable to consider in the strategy of the powerful players of the brewing industry, so that the sand in their shoe becomes a solid and sharp stone. Transparency Disclaimer: Cervezas Ámbar sent me a free can of Ámbar IPA, as well as most of the bottles of the 'Ambiciosas' series.